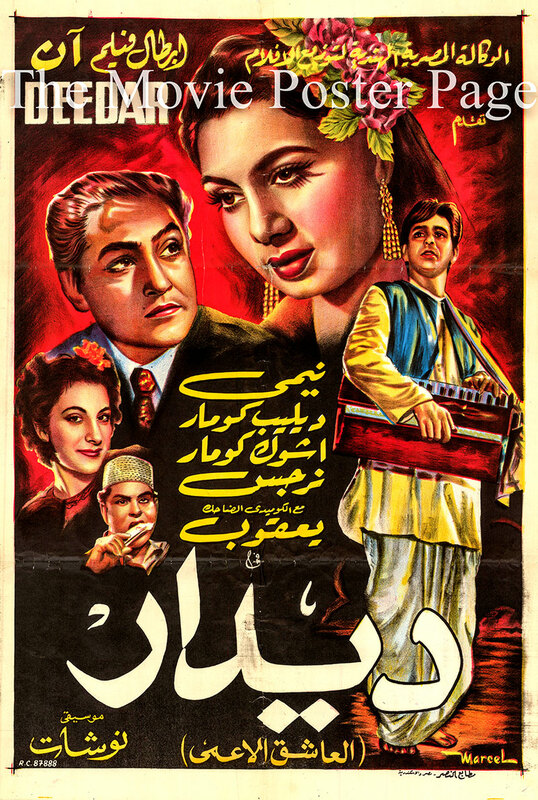 Watch on YouTube This is a 27" x 39" Egyptian poster designed by Marcel for the 1951 Nitin Bose film Deedar written by Azm Bazidpuri and starring Nargis as Mala. Plot summary: Shamu [Dilip Kumar] and Mala [Nargis] are childhood sweethearts who love to go riding and singing on a horse. One day Mala is injured when they are thrown from the horse; Mala's angry father banishes Shamu from the household. Shamu and his mother are obliged to move; after the death of his mother Shamu loses his sight in a sandstorm. From then on Shamu makes a livelihood as a street singer accompanying himself on a harmonium, but he never forgets Mala and always longs to be with her again.